Sampling sites located ~250 m from the Columbia River in the Hanford Site 300 Area. 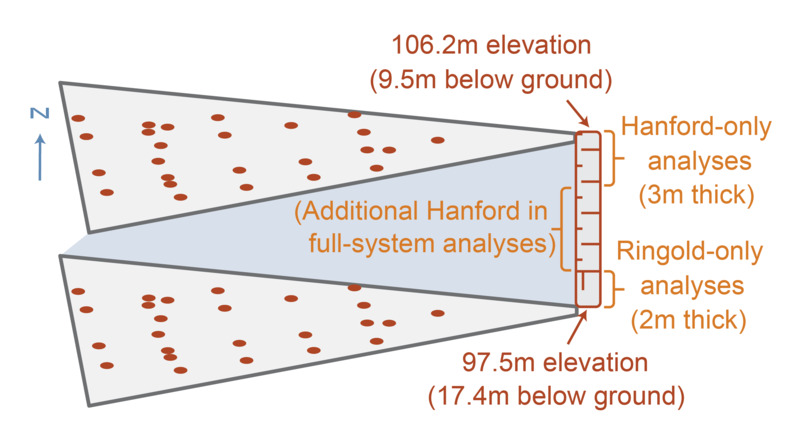 Red circles show two-dimensional distribution of sampling locations, while the maximum horizontal distance between any two communities is ~53 m. The Hanford and Ringold formations are shown with horizontal and vertical dashes, respectively. Formation-specific analyses examine communities across the specific vertical ranges shown, whereas the "full-system" analyses include additional communities in the middle section of the Hanford formation. Results: To enhance the study of subsurface microbial communities underlying the U.S. Department of Energy's Hanford Site, scientists at Pacific Northwest National Laboratory developed a novel analytical framework that advances ecological understanding in two primary ways. First, it quantitatively estimates influences of major ecological processes, such as selection of the most competitive microbes, the movement of microbes through space, and chance events. Second, it uses ecological patterns to characterize measured environmental variables, such as nutrient resources, temperature, or mineralogy, as well as the spatial pattern of unmeasured variables that select for particular microbial taxa or constrain microbe movement through the subsurface. The framework, which combines a number of different statistical analyses, showed that microbial community changes in space and time are affected by multiple ecological processes, and the relative balance among processes varies across geologic formations and spatial scales. The ultimate result is a conceptual model of microbial ecology within and between geologic formations underlying the Hanford Site's 300 Area. Further, the ecological knowledge provided by the new statistical approach far outstrips information provided by other approaches. Why It Matters: Spatial turnover in the composition of biological communities is governed by a combination of ecological processes, yet commonly applied statistical approaches can't quantitatively estimate the relative influences of these processes, nor can they rigorously identify environmental features that impose them. The PNNL-developed framework is broadly applicable and can be used to make direct comparisons across spatial scales; in different ecosystems, such as terrestrial soil and surface water; and with other taxonomic groupings, such as plants and fungi. In particular, the framework will enable improved predictive modeling of spatial and temporal variation in microbial communities. Coupling the framework to biogeochemical models can lead to more precise models that better predict important processes, such as contaminant transport or the fluxes of greenhouse gases. Methods: The framework leverages evolutionary relationships among microbial taxa and combines that information with statistical randomization approaches and spatial patterns in microbial community composition. It further characterizes the spatial structure of an unmeasured environmental variable that selects for particular microbial taxa. What's Next? Work to date in the Hanford 300 Area points to a strong influence of river water intrusion from the Columbia River on subsurface microbial communities. Field efforts are currently under way to more directly evaluate the effects of river water intrusion on subsurface microbial processes. The new analytical framework will be critical for interpreting linkages among biotic and abiotic components in space and time. In addition, metagenomic information will be exploited to extend the analytical framework beyond microbial community composition to its metabolic potential. Resulting ecological inferences will be used to develop more biologically informed, field-scale biogeochemical models that incorporate spatiotemporal predictions of the potential for biogeochemical reactions. Sponsors: This research was supported by DOE's Office of Biological and Environmental Research, as part of the Subsurface Biogeochemistry Research Program's Scientific Focus Area and Integrated Field-Scale Research Challenge at PNNL. James Stegen's work was supported by a Linus Pauling Distinguished Postdoctoral Fellowship at PNNL. Research Team: James Stegen, Allan Konopka, Jim K. Fredrickson, Xingyuan Chen, David Kennedy, Christopher Murray, and Mark Rockhold, all PNNL; and Xueju Lin, Georgia Institute of Technology. Reference: Stegen JC, X Lin, JK Fredrickson, X Chen, DW Kennedy, CJ Murray, ML Rockhold, and A Konopka. 2013. "Quantifying Community Assembly Processes and Identifying Features That Impose Them." The ISME Journal 7:2069-2079. DOI: 10.1038/ismej.2013.93.